Since this time of year is pretty much all about the returning of the sun, I thought we would do something sparkly and light and fun. March's prompt is to use a bezeled chaton or rivoli in your creation. As a sort of add on - extra 'points' if you come up with a bezel that isn't peyote or right angle weave! Both of those are perfectly valid and acceptable, however, and if those are your most comfortable go-to stitches, feel free to use them. I know that bezeling can be challenging for some beaders, especially those just starting out, but it's totally worthwhile to learn if you aren't there yet - the bling alone makes it a must for most of us! I had a bit of a poke around various places looking at bezels and came up with a few to share, because - SHINY! 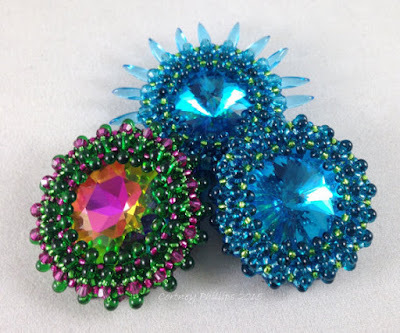 Also, if you haven't seen these before, they may tempt you if you haven't tried bezeling yet - and a few of them use different stitches and/or beads than you may have attempted to bezel with previously. 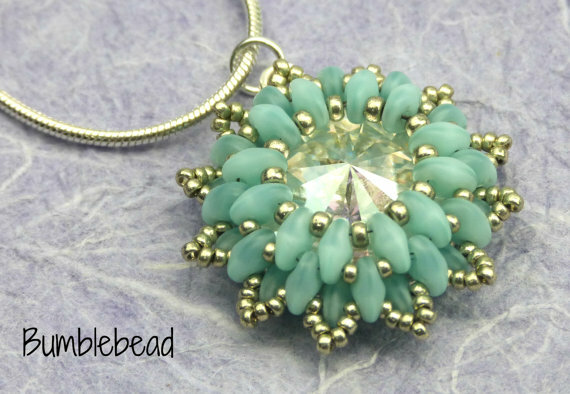 This is a beautiful pendant by Carol Paris of Bumblebead that uses Superduos to bezel a rivoli. You can find that HERE, if you'd like to give it a go. These lovely bezels are made using flat, two holed Czech triangle beads, and Laura Graham has the tutorial HERE. 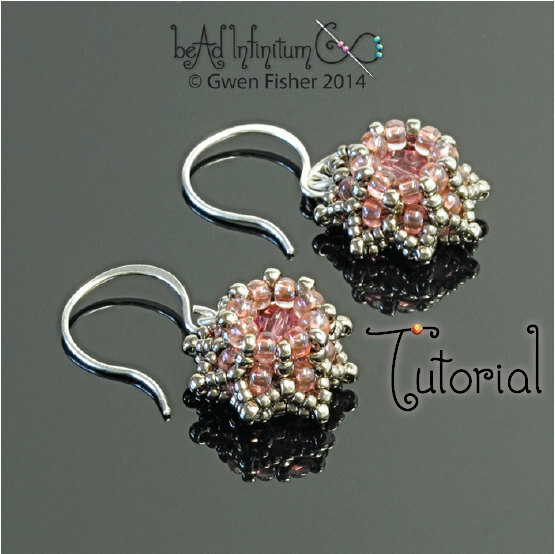 These dainty seed bead beauties are made by Gwen Fisher and are called mini crowns - you can find the directions HERE. Cynthia Newcomer Daniel also has a wonderful little pair of star earrings that I love, HERE, and her netting bezel is gorgeous in its simplicity. 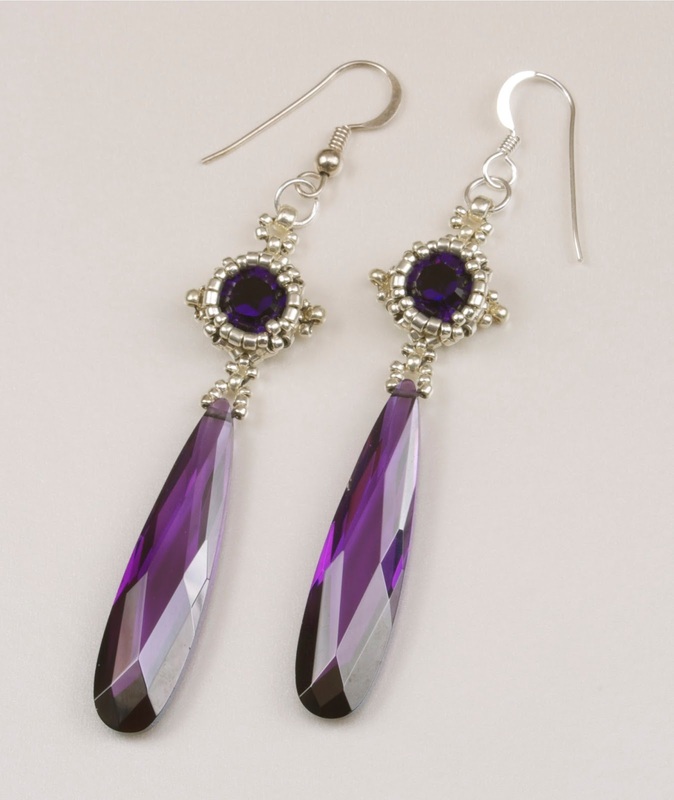 Kassie Shaw, of The Beading Butterfly, offers these delicate bezeled 12mm rivoli earrings, HERE. Cortney Phillips of Baubles By Cortney has this lush chenille stitch bezel in her tutorial section HERE. Yes! Chenille to bezel!! 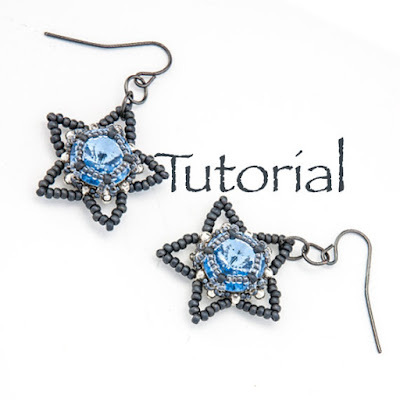 And last but not least, you can find two different free bezeling tutorials on my website - my Lila Earrings tutorial bezels a chaton, and the Perfect Evening Earrings use various sizes of rivoli. My free tutorials page is HERE. 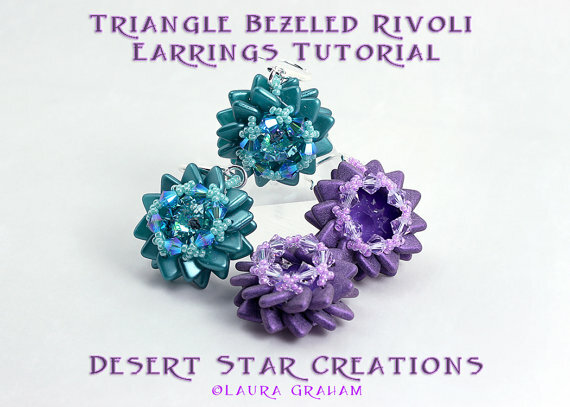 (Although you will have to come up with a different drop crystal if you choose to try to make the Lila set, as I can't find a distributor for those lovely long cubic zirconia drops any longer, sadly.) These two are very basic bezels - RAW/herringbone and peyote respectively. I hope you enjoy the shiny of this month's prompt, and it brings some glitter to the dreary last gasps of winter. Happy beading!